The aircraft.cfg file specifies the versions of the aircraft included in the aircraft container, as well as the attributes (name, color, sound, panels, gauges, and so on) for each aircraft and where to find the files that define those attributes. Within the aircraft.cfg file there are a number of sections. Brackets enclosing the section name identify the various sections. In order for the simulation to make proper use of any variable, it is important that the variable be located in the correct section. While exact spelling is important, none of the terms is case-sensitive. Additional paths can be added to this file. The paths are either relative to the root folder of the simulation, or absolute paths -- which can also point to locations on other computers (using the "\\computer name" notation). For Windows XP the ESP.cfg file should be in the C:\Documents and Settings\<user name>\Application Data\Microsoft\ESP folder. For Windows Vista the file should be in the C:\Users\<user name>\AppData\Roaming\Microsoft\ESP folder. Configure a key command to Reload User Aircraft (which will reload your aircraft from within the simulation). To do this go to Settings, Controls Assignments, and scroll down to the Reload User Aircraft event. By default, it’s unassigned. Use Change Assignment to configure a keystroke combination for this event. Once assigned, you can use this key command to reload the aircraft within the simulation. Turn off AI Traffic. AI traffic aircraft are maintained in the cache and even if you update the aircraft you are currently piloting, if the same aircraft is being used by AI traffic, then your cache won’t get updated automatically by simply reloading the plane. So to ensure your aircraft is reloaded from disk, you must also go to the Settings Screen, choose Traffic, and set the Air Traffic Density slider all the way to the left to 0%. Now you can test changes made to an aircraft.cfg within the simulation by using the Reload User Aircraft key command after each change, or set of changes, is made. Aircraft initialization failure. Indicates that some essential files are missing from the aircraft container. If the files are missing, the aircraft will not usually be displayed in the Select Aircraft dialog box; as a result, this error is rare. This is not a Flight Simulator aircraft model. The visual model (.mdl) file for this aircraft is not compatible with ESP. For instance, there are several versions of the Cessna 172, all housed in the same C172 aircraft container (folder). The various versions must vary by their title, and may also vary other items such as the panel, description, and sounds. While these configuration sets share many components, they can each use different panels. The panel= line in the respective fltsim sections thus refer to the respective panel folder for each aircraft: For example, panel=ifr means that this version of the C172 uses the panel files in the panel.ifr subfolder. When creating and referencing multiple model, panel, sound, and texture directories, use the naming convention foldername.extension, where the extension is a unique identifier for that configuration set (for example, .ifr). To refer to the folder from the relevant parameter in the aircraft.cfg file, just specify the extension (for example, panel=ifr). If a parameter is not explicitly set it automatically refers to the default (extension-less) folder. The parameters in each configuration set can refer to the same files, to different files, or to a mix of files. While using different panels, all Cessna configurations use the same sounds, and thus the sound parameters in all the fltsim sections point to the single sound folder in the C172 folder. Each aircraft defined by a configuration set will appear as a separate listing in the Select Aircraft dialog box. The fact that multiple aircraft share some components is hidden from the user. From a user’s perspective, they are distinct aircraft (just as if all the common files were duplicated and included in three distinct aircraft containers). From a developer’s perspective, the aircraft are really just different configuration sets of the same aircraft. Because they share some files, they make much more efficient use of disk space. atc_parking_codes Specifies one or more ICAO airline designations so that ATC can direct the aircraft to a gate that has also been designated specifically for that same airline, for example, "AAL" for American Airlines. Refer to the example XML for the TaxiwayParking entry in the Compiling BGL document. The codes entered in the airlineCodes entry should match the text entered here. The ICAO codes do not have to be used, and can be as short as one character, as long as the text strings match, but for clarity use of the ICAO codes is recommended. In addition to the fltsim sections, the general section contains information related to all variations of the aircraft. station_name.n This field is the string name that is used in the Payload dialog (15 character limit). Omission of this will result in a generic station name being used. Each entry can be followed by a 1 if the effect is to be run for a single iteration. Set this number to zero or leave blank (the default), for the effect to continue as long as the respective action is active. Make an entry in the configuration file to replace any of these effects with a new one. Or to turn off the effect add an entry that references the fx_dummy effect (which does nothing). The following flags are legacy, and were enabled to allow aircraft to be configured with no pitch and/or bank modes. While these flags are still supported, the preferred flags are included above in the respective vertical and lateral sections. use_no_default_pitch Setting this flag to 1 will cause the default pitch mode to be "None". It will actually set the variable default_pitch_mode to zero, so that there is no default pitch mode when the autopilot logic is activated. The preferred method is to tset the default_pitch_mode directly. use_no_default_bank Setting this flag to 1 will cause the default bank mode to be "None". It will actually set the variable default_bank_mode to zero, so that there is no default bank mode when the autopilot logic is activated. These parameters define the simulated stick shaker force felt in the stick or yoke when flying an aircraft equipped with a stick shaker (such as the Learjet 45). A piston engine’s power can be determined through a series of equations that represent the Otto cycle of a four-stroke piston engine, multiplied by the number of pistons available. This section contains all the information needed to be able to determine how much power the engines are capable of producing. Power can also be scaled from the calculated values generated for piston engines with the “power_scalar” property. If a tailhook entry is made, it will override the attachpt_tailhook_pivot and attachpt_tailhook_hook entries for the aircraft, if these attach points exist. If a launch_assistance entry is made, it will override the attachpt_Launch_Bar_Pivot and attachpt_Launch_Bar_Lug entries for the aircraft, if these attach points exist. The following sections are specific to helicopters only. The implementation of the Bell 206 helicopter is a legacy implementation that cannot be configured by changing data in the configuration file. The [helicopter] section is the only helicopter-specific section that is used by the Bell 206. Other helicopter models do use the data in the configuration file to determine their aerodynamic performance, and utilize all the following helicopter-specific sections. low_realism_stability_scale This scales the stability of the Bell 206B helicopter to make the aircraft easier to fly. It has no effect on the other helicopters. The stability factor is broken down into three components: pitch, bank, and yaw damping. The stability factor is scaled according to the pitch, bank, and yaw values set. 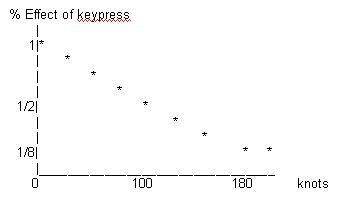 For example, increasing the first value (pitch) to 1.1 increases the pitch-damping factor by 10 percent. Increasing these values excessively will result in excessive damping, making it hard to control the helicopter. Displays the briefing for the flight, if there is one. The text displayed on the Briefing page of the kneeboard is flight-specific, and is located in the corresponding subdirectory of the Flights directory. Logs the last 10 Air Traffic Control radio transmissions to your aircraft. The text displayed on the Radio page of the kneeboard is automatically generated as you use the Air Traffic Control feature. The text cannot be modified. Provides a list of waypoints, headings, and other information for a flight plan created using the Flight Planner. The text displayed on the Navigation Log page of the kneeboard is automatically generated from an active flight plan. The text cannot be modified. Provides a complete list of keyboard commands. The text displayed on the Key Commands tab of the kneeboard is located in the main Aircraft folder, and is named kneeboard_keys.htm. Lists step-by-step procedures for the aircraft you're flying that (when used in conjunction with the speeds on the Reference page) make for a more realistic experience. The text displayed on the Checklists page is aircraft-specific, and saved in an .htm file in the aircraft container (aircraft folder) associated with each aircraft. The file for the Checklists page is named aircraftname_check.htm where aircraftname is the name of the aircraft (e.g., extra300s_check.htm). Lists recommended speeds for the aircraft you're flying: how fast to fly during each phase of flight, and what the limits are. The text displayed on the Reference page is aircraft-specific, and saved in an .htm file in the aircraft container (aircraft folder) associated with each aircraft. The file for the Reference page is named aircraftndame_ref.htm where aircraftname is the name of the aircraft (e.g., extra300s_ref.htm). where aircraftname is the name of the aircraft (e.g., extra300s_check and extra_300s_ref). Note that no .htm extension is needed here. You can create or open kneeboard .htm files with NotePad or any other text editing program that can read and save files in text format, and edit them using HTML 4.0 conventions. After you've made changes to any kneeboard .htm files, be sure to reload the page on the kneeboard: select a different page on the kneeboard, then return to the page you modified. 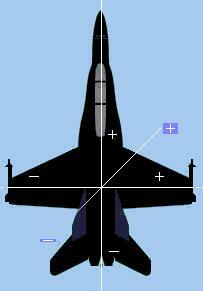 The panel.cfg file is located in an aircraft’s Panel folder, and defines the characteristics of the aircraft’s cockpit, including window settings, view settings, and gauges. For a full explanation of the structure of a panel.cfg file and instructions for editing it, see Panel Configuration Files. The model.cfg file is located in an aircraft’s Model folder, and specifies which visual models (.mdl files), exterior and interior, to render during normal flight and optionally after a crash. Some legacy implementations had the interior model included with the exterior model. If a legacy model exists with both interior and exterior models in the same .mdl file, the models will be rendered correctly with a single normal parameter. However this method of storing models is inefficient, as the interior model is only needed on aircraft that are being controlled by the user. Note that if a user has created a full cockpit out of hardware add-ons, and does not wish to see the interior model at all, then the interior entry can be left blank. In this case the user will not be able to see the exterior parts of the aircraft that are visible from the interior, but will get a clear view forward, left, right, and so on, which may be a better experience. crash 3D model used if aircraft crashes. No examples of crash models are available. To edit a mipmapped texture, you’ll need to use Image Tool, an image editing application included with the SDK. Be sure to save a copy of the original file before attempting to modify it. A texture can also be edited using a simple graphics application such as Paint, though it will be saved as a standard .bmp file instead of a mipmapped .bmp. The simulator will automatically generate the mipmaps for a texture (if none exist), although these mipmaps may not be of as high a quality as mipmaps created using ImageTool (supplied with this SDK). For more details on the texture configuration file, refer to the document Texturing Aircraft Models. Relative path from the Microsoft ESP/1.0/ folder. The 757 aircraft would then use the 737-400 panel.cfg file (and the associated .bmps). The syntax for aliasing model.cfg and sound.cfg files is identical.